“Lakes of Oklahoma” is compiled by the Oklahoma Water Resources Board and published in cooperation with the Wildlife Department. It is the premier source for maps and information on Oklahoma lakes. This atlas contains maps of more than 140 lakes into a single volume, showing details such as water depth, boat ramp sites and other recreational information. This atlas was published with funds granted through the Sport Fish Restoration Program, which is supported by a special excise tax paid by boaters and anglers. 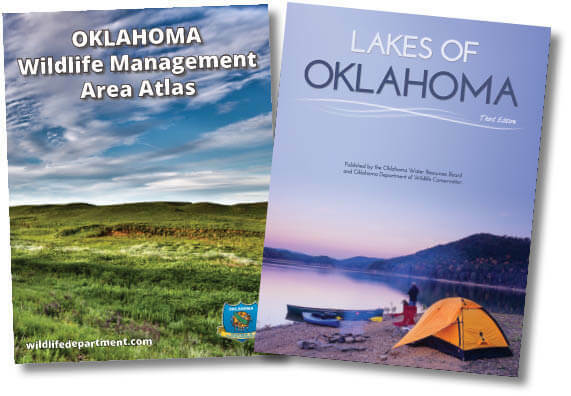 “Lakes of Oklahoma” is free of charge when picked up at the Oklahoma Department of Wildlife Conservation headquarters, 1801 N Lincoln Blvd., or the Oklahoma Water Resources Board office, 3800 Classen Blvd., Oklahoma City. To request a copy by mail, go online to owrb.ok.gov or call (405) 530-8800 (a postage fee is required).